As you can see from the Amharic script, this one is Ethiopian, and is part of a long parchment strip that includes other images. St. George’s cape is wacky, and he seems to be disproportionately drawn, but I like how this image doesn’t just have the hand of God coming out of the sky, but the face of God himself! St. George keeps his eyes on God, and his spears still hit the dragon right in the mouth (“Use the Force, Luke”). It’s interesting how he’s using throwing spears, and not a lance, as he’s usually depicted. The ribbon of Saint George is a widely recognized symbol of remembrance of the Soviet people who fought in the Great Patriotic War, WWII. The ribbon consists of a black and orange bicolour pattern, with three black and two orange stripes. It appears as a component of many high military decorations awarded by the Russian Empire, and the current Russian Federation. The stripes signify the fire and fog of war. While the symbol is primarily related to WWII, it has recently become more associated with Russian nationalism. The symbol was promoted by the post-soviet Russian state as a way to unify people and remember and respect those that fought. It was also promoted in 2005 as a response to the liberal Orange Revolution in Ukraine. That year, Russian state media along with youth organizations launched the campaign ahead of World War II memorial celebrations. The ribbon was associated with units who were awarded the collective Guard battle honours during the conflict, due to the usage of the color scheme in the Great Patriotic War victory medal awarded to all personnel, civilian or military, who aided the war effort. In Russia, the ribbon of Saint George is also used by civilians as a patriotic symbol and as a symbol of public support to the Russian government, particularly since 2014. In Ukraine and the Baltic states (Estonia, Latvia and Lithuania), the symbol has become widely associated with Russian nationalist and separatist sentiment. 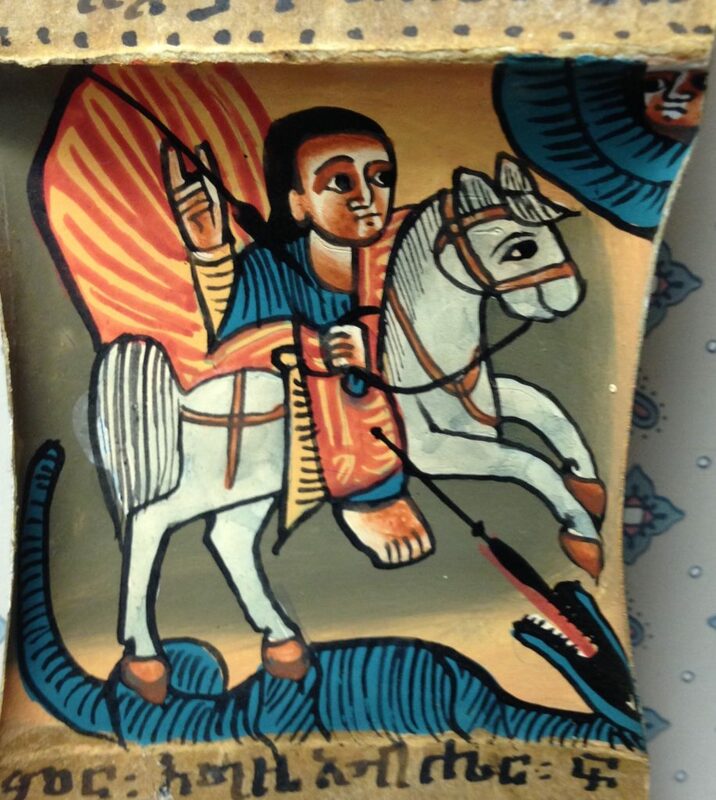 This entry was posted in Art and Art History, Ethiopia, St. George by jgood. Bookmark the permalink. Why are there narrow orange stripes at the top and bottom? Good question. It’s aesthetically ungainly isn’t it.